Nigeria’s Second National Operator (SNO), Globacom Limited has inked technology deals with Nokia Alcatel-Lucent, a telecoms equipment manufacturer and Vocalcom Technology of France. Mrs. Bella Disu, Executive Vice Chairman (EVC) at Globacom announced the tech deals with the two French companies on the sidelines of the 2019 Choose France International Business Summit held Monday at the Chateau de Versailles, France. The Nigerian SNO will also deepen its business partnership with France and French companies to advance its plans to be a major telecoms powerhouse, the company’s EVC says. According to Mrs. Disu, the deal with Nokia Alcatel-Lucent will see the global telecoms equipment manufacturer supply, install, and integrate a new Sure Pay Intelligent Network platform. Chairman of Heirs holdings; Mr. Tony Elumelu (left); Executive Vice-Chairman of Globacom, Mrs. Bella Disu and Chairman of Dangote Group; Aliko Dangote at the Choose France Summit at Château Versailles in France. The SNO says that the Nokia Alcatel-Lucent will substantially enhance Globacom subscribers’ experience. “These agreements are geared towards ensuring that Globacom continues to provide first-rate telecommunications services in the countries where we operate,” Mrs Disu says. The Globacom’s EVC joined over 150 global business leaders that attended the 2019 Choose France International Business Summit where executives from multinational companies across the world met with the President of France, Mr. Emmanuel Macron at a dinner organised to promote France’s attractiveness as a business environment. They also used the Summit to publicise major investments and partnerships involving French companies. Earlier on Monday, she attended the inaugural meeting of the France-Nigeria Investment Club, which President Macron launched during his 2018 visit to Nigeria. The Globacom EVC says her engagements with global business leaders in France is impactful, adding that it was an important platform for exploring collaborations and business development. “We have long chosen France, and we welcome every opportunity to expand our interests and alliances here,” according to her. 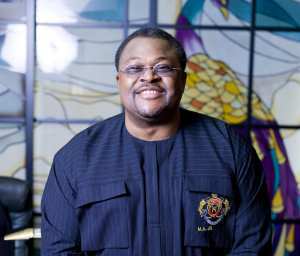 The Mike Adenuga Group founded by Nigerian businessman, Dr Mike Adenuga, Jnr is known for its strong ties with France, the telecoms company says. Globacom and Conoil Producing Limited have had over a decade of strong business relationships with French companies, including Total and Alcatel, which is now Nokia Alcatel-Lucent. The group of companies also supports the principal international French cultural organisation, Alliance Francaise, in Lagos. During his state visit to Nigeria last year, the French President commissioned the state-of the-art Mike Adenuga Alliance Francaise Centre donated by the Globacom Chairman, Dr. Mike Adenuga, to promote French and Nigerian cultures in Lagos, according to a company statement. Bank Verification Number: NIMC’s Nemesis or Nunc Dimitis?